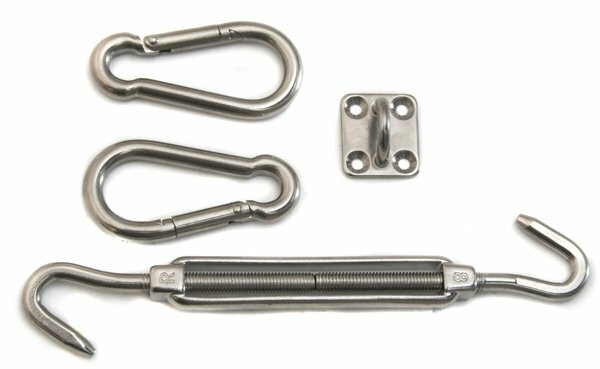 This stainless steel fixing kit is ideal for installing square and rectangular sail shades to all solid structures such as concrete, brickwork and wooden beams. The high quality, grade 316 steel fixtures are durable and weather resistant. The kit includes everything you need for quick and easy installation. "It is well suited to the job and does not rust. Primrose could have cut corners but obviously wanted the ob done well." "Nicer look than I thought." "Great product but no installation help. Had to find out how to securely fasten everything together in terms of knots"
"Just what is needed for the job"
"Came in handy when mounting the awning. More equipment than necessary." "Hardware quality is very good!" "Excellent quality fixings for our shade sail." "well made and as stated to be"